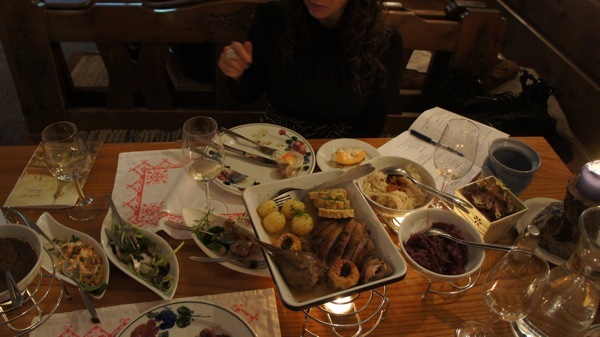 Out of our two days of winery visits in the Wachau, our favorite was at Nikolaihof. 31-year-old Nikolaus Saahs, now the winemaker, showed us around his family’s winery and cellar, the oldest winery in Austria, with origins dating back to the year 985. It’s been under his family’s ownership since 1894. 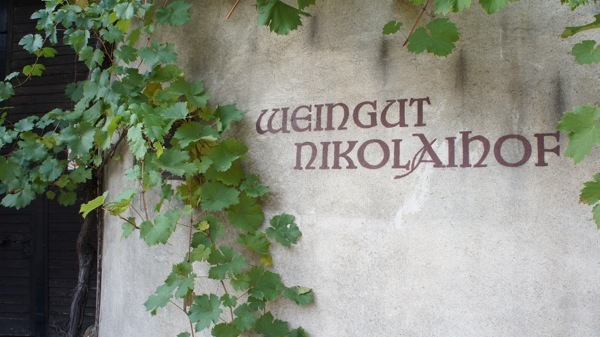 Nikolaihof was also the first winery in Austria – if not the world – to use biodynamic practices, though not at first by choice. When Nikolaus’s father, Nikolaus Sr., started making wine in 1960, he had no money to purchase chemicals to help fertilize the grapes. They formalized their philosophy in 1971 when his mother, Christine, helped to define and implement true biodynamic practices. 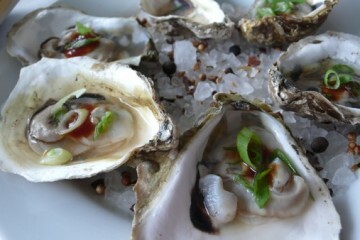 They also hand-harvest, use only wild yeasts, and don’t control the temperature during fermentation. 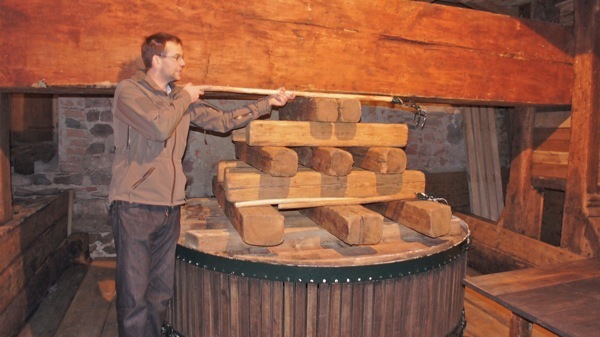 Plus they own the largest wooden grape press in the world – it’s more than 320 years old! 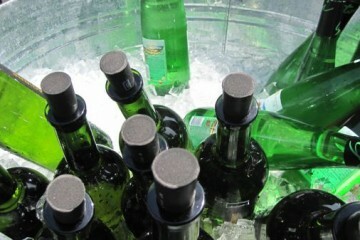 – which they’re still using for selected wines. 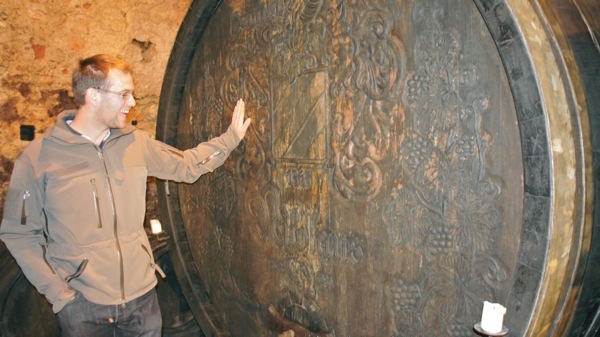 Winemaker Nikolaus Saahs with the largest wooden grape press in the world. 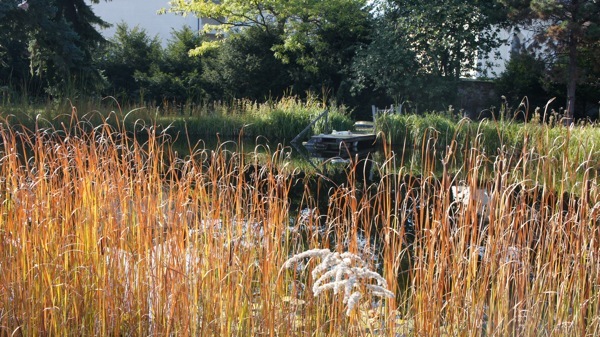 The 22-hectare Nikolaihof vineyard uses 20 to 30 types of grasses as ground cover and fertilizes with cow manure. (They currently use the manure from a nearby farm, though Nikolaus hopes to have his own cows sometime soon.) As part of the biodynamic process, he participates in burying 2,000 cowhorns with 70 other people working in biodynamic agriculture (mainly not wine production) about 50 km away. 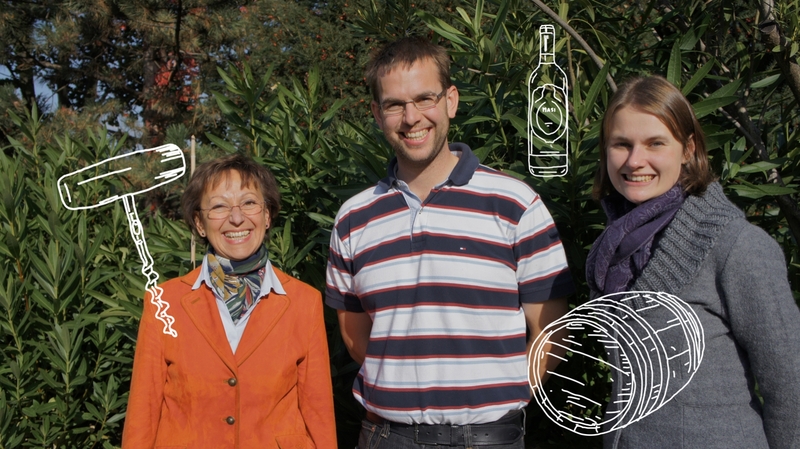 Nikolaus considers both the past and the future when making his wines, saying that “everything about winemaking is thinking about generations.” He says it’s important to him to gain knowledge from the older generations while maintaining practices and quality that can be passed along to family in the future. Most of the Nikolaihof vines are 40 to 45 years old, and they produce about 70 to 80,000 kl per year of 50 percent Riesling, 30 percent Gruner Veltliner, and 20 percent other varieties including Neuberger, Muskateller, Gewurtztraminer, and Chardonnay. Nikolaus with a cask from the year he was born, still in use. 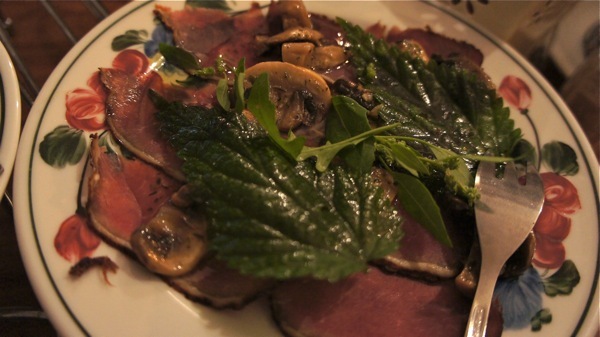 The family also runs an intimate restaurant where regional specialties are prepared with mainly local and organic ingredients. We enjoyed a fabulous spread, served by Nikolaus and his girlfriend, Gudrun, of plums wrapped in ham; smoked venison; a raw veggie salad with carrots, leeks, celery, apples, and cream; pates including goose liver, venison, and pork with walnuts; feta cheese with pumpkin seed oil and fresh herbs from the garden; black pudding roasted with apricot mustard; marinated housemade aspic with wild herbs; and three spreads: herb cheese, Liptauer spicy cheese, and goose greaves lard, all served with homemade bread. 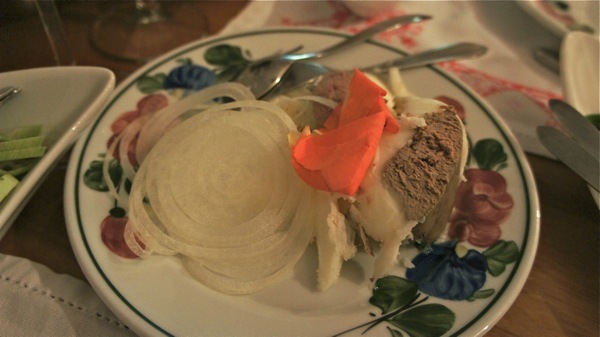 For the main course, we loved the fabulous organic goose served with bread dumplings, potato dumplings, two types of cabbage salad (one red and tasting of cloves, and one white and tasting like sauerkraut), and lentils. Though we admittedly don’t have goose very often in the U.S. so aren’t very familiar with it, this one was moist and flavorful without being too gamey or fatty-tasting. It was an amazing feast. 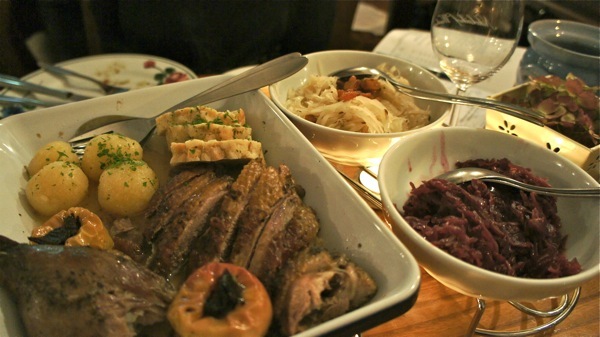 Organic goose with bread dumplings, potato dumplings, and cabbage salads. 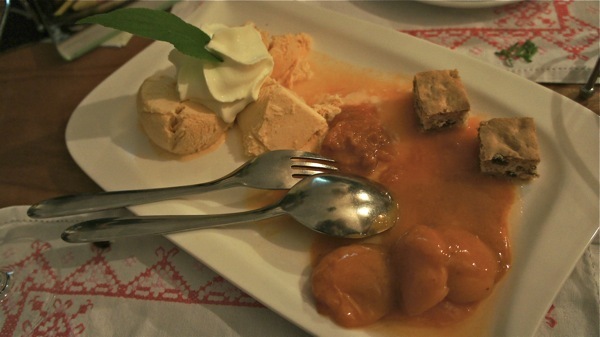 Last but not least, we ended with one of the specialties of the region – apricot, in many forms: Fresh, light apricot ice cream served with apricots and biscuits. 2010 Im Weingebirge Gruner Veltliner Federspiel, light and clean with citrus and good minerality. 2009 Im Weingebirge Gruner Veltliner Smaragd, more elegant with floral notes. 1993 Nikolaihof Vinothek (Gruner Veltliner), smooth with butter and nuts on the palate. 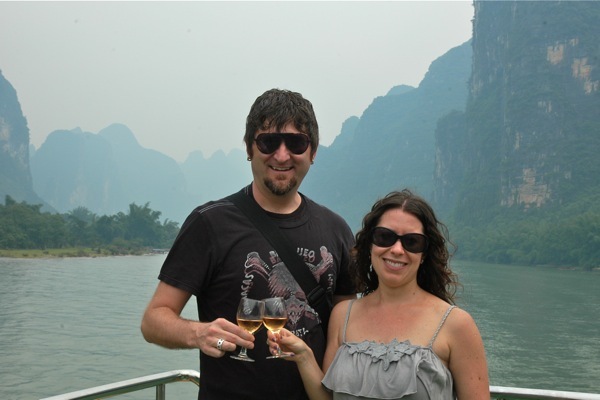 This wine is from their Vinothek label, where they’re holding back wines in the big casks where they were fermented for years before bottling, imparting richer and more complex flavors. This particular wine was in cask for 15 years before bottling in 2008. We’re kicking ourselves for not bringing one of these home – while it would have been a splurge at 63 Euros a bottle, we just saw it in a New York City wine bar for $360 a bottle! 1999 Sussenberg Gruner Veltliner (Auslese), rich with hazelnuts and apricots. 2005 Nikolauswein (Trockenbeerenauslese), honey and nutty flavors with hints of smokiness. 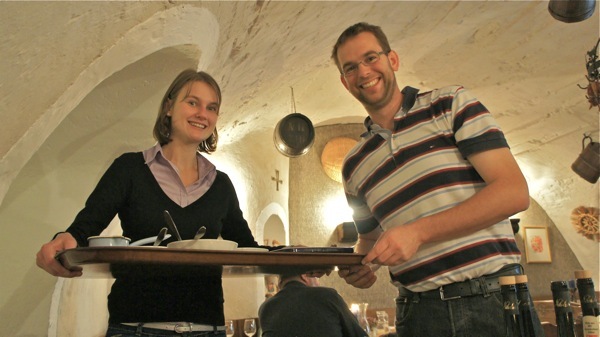 For complex yet clean wines with real aging potential, we suggest you look for Nikolaihof wine at a wine store, restaurant, or wine bar near you – or better yet, go visit the friendly family at the Austrian source! 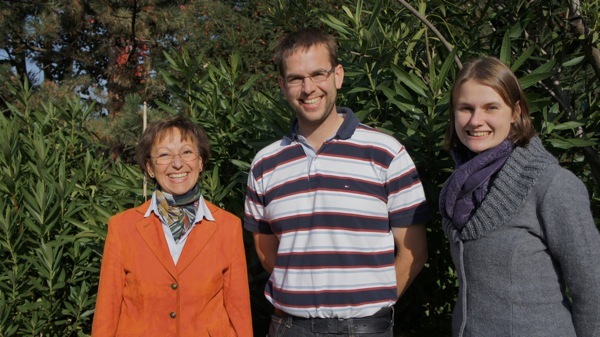 Christine Saahs, her son Nikolaus, and his girlfriend Gudrun.